Personal Change & Stress Techniques For Your Personal Improvement Plan! How many times have you been in traffic and wished you had something of value to listen? Feel Good about yourself on a "Bad Hair Day" or even when you make a "BIG Goof"? Improve Study Habits program which gives you the ground work for knowing the subject well enough to teach it. The Secrets to Attracting Health, Vitality, and Prosperity. Open all Charkras for Spiritual, Emotional and Physical Health. Whether jilted by a lover, divorced, or loss of loved one through death, this series of self help mp3 downloads and stress management CD's will take you through the grief and loss and get you back on track to living life again. Please help save our planet: support hydrogen fuel--not ethanol which still produces greenhouse gases when combusted. "Your CD's are the real deal. Many other self-help programs talk a big game but fail to deliver. You on the other hand, have made an immediate positive impact on my perception of myself. I feel blessed to have the chance to learn from you." Unless you're dealing with a health crisis, it makes sense to begin your personal change with Self Help Audio mp3 Downloads and CDs. 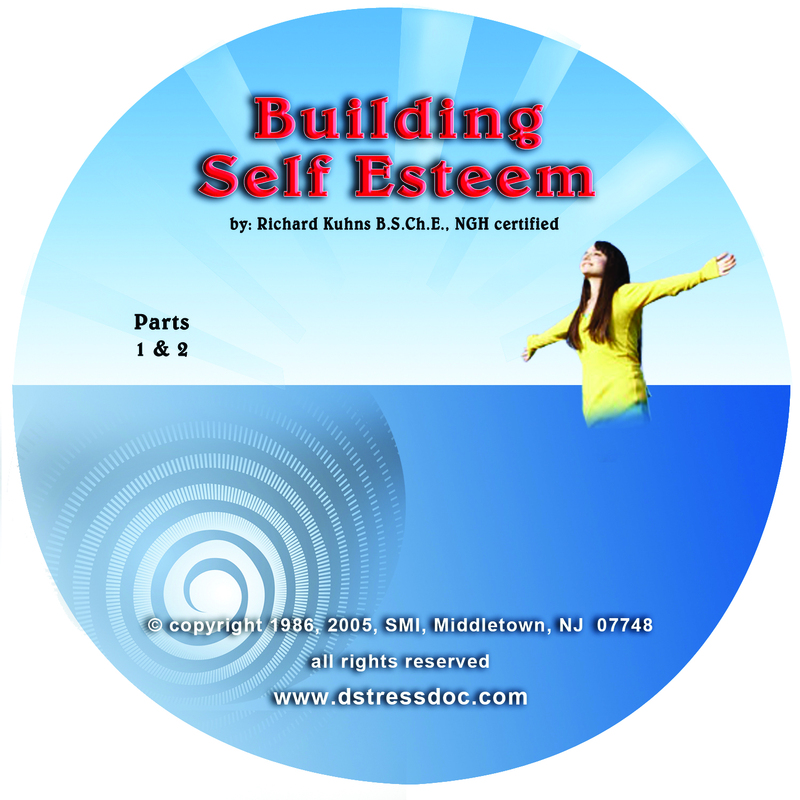 These Stress Techniques are the best selling self help audio CD programs for your Personal Improvement Plan developed by Richard Kuhns utilizing Silent Subliminals where appropriate. Why hypnosis? In reality hypnosis is the art of suggestion which can be verbal (auditory) or visual. The goal is to influence a desired change in behavior and what stands in the way are the limiting or conflicting beliefs housed on one's subconscious mind. "I can't learn fast enough!" "I'm too short, fat, uneducated..."
Literally dozens of these limiting beliefs for many situations exist. Mary despised her dad for making her mother's life miserable. After her mother died, she had her dad come live with her. When asked about how she feels about her dad, she said, "You're supposed to love your dad!" Two conflicting unresolved beliefs led to Mary being very unhappy and depressed. Recognizing the conflict in belief is the first step in self help. Because you are the guardian of the suggestions you now accept, all hypnosis is really self hypnosis. Yet not every thing is about accepting suggestions. Often times there are real stress management training exercises along with nutritional adjustments that are required. Not all personal change requires investigating conflicting beliefs! Most times issues such as muscular pain and discomfort, poor circulation as in cold hands or feet can be greatly helped by basic stress techniques. Stress techniques such as deep breathing exercises, muscle awareness exercises, vascular relaxation, and centering. Your personal improvement plan may be greatly facilitated by the Stress Management Training Series. Richard Kuhns B.S.Ch.E. NGH certified (a chemical engineer) brings a revolutionary approach to self hypnosis self help audio CD and Self Help MP3 Downloads "For instance, I found early on clients would drop a lot of weight with hypnosis and self hypnosis, but then gain it back. It was frustrating. Yet, clients who were taught stress management techniques dropped weight without even trying. I learned that it's actually the marriage of self hypnosis and stress techniques that makes it powerful." And using every tool available, where appropriate silent subliminals are used. Please note that designing silent subliminals is an art and that many who use silent subliminals may inadvertently use non productive and in some cases suggestions counter productive silent subliminals. For instance, "I am not going to eat something," or, "I am going to give up or do without," are two counter productive suggestions and is best to never use them. Counter productive firstly because of the word, "not." This is because the brain skips over the word, "not," and the focus is on eating something and the second of the silent subliminals is a problem because the brain hates the idea of giving up (associated with the opposite of winning) or doing without (associated with punishment). Thus it would be counter productive to use these types of messages as silent subliminals. Fact is that it's best to never use CDs with silent subliminals unless the suggestions are identified for some well meaning authors may inadvertently use counter productive suggestions in their self help audio CD. For instance with emotional eating, using the power of suggestion (hypnosis) you may be pleasantly surprised to find that you eat what you really want and will be amazed to find that what you want is far less in quantity and far more nutritious than you ever imagined possible as you fill up on flavor and taste. Add subliminal messages and you won't find a more effective and comprehensive program. Trouble going to sleep? Using suggestion put your body asleep one part at at time and sleep soundly through the night. If you want to learn more about hypnosis, self hypnosis, and stress management strategies for your personal change and improvement plan there are many free articles available in this website as well as you can subscribe to the Free Seven Part Report "Discover the Little Known Secrets--What makes Hypnosis Work" and Monthly Stress Managment (misspelled) Tips BulletinSM using the form above. PLEASE NOTE: All prices given are internet pricing and only apply to purchases made through our on-line cart. Orders placed by phone or mail--add 20% to all pricing. If you don't have a paypal account--no problem. You can use any credit card at the check out. Paypal will accept it and give you the option of opening a paypal account.